And when he is waxed strong through his riches, he shall stir up all against the realm of Greece. -He probably equipped the largest army ever assembled, perhaps not less than five million. 11:3. And a mighty king shall stand up, that shall rule with great dominion, and do according to his will. -He died at Babylon on his return journey 323 B.C..
and shall be divided toward the four winds of heaven, but not to his posterity nor according to his dominion wherewith he ruled; for his kingdom shall be plucked up, even for others besides these. -It did not pass to his descendents. -His empire was divided among four of his generals. 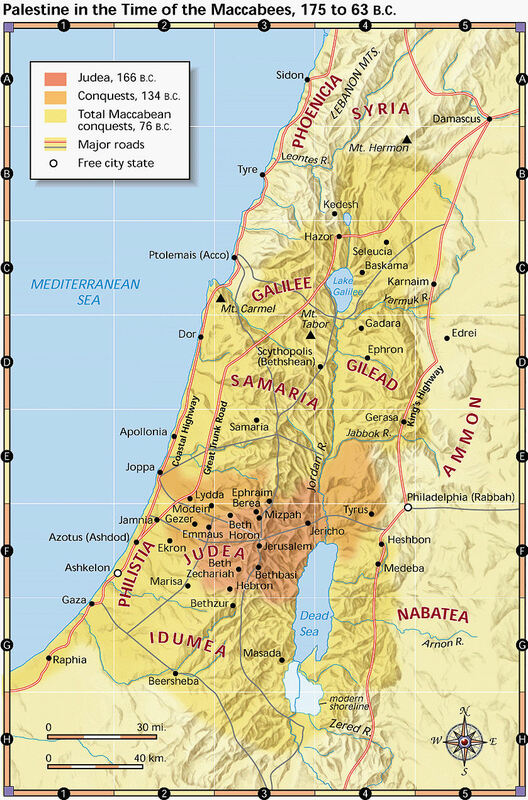 (1) Cassander assumed the government of Macedon, Thessaly & Greece in the East. -In the reigns of Antiochus Theos and Ptolemy Philadelphus. -Married to Antiochus Theos of Syria after putting away his former wife, Laodice, and to disinherit her children. And he that strengthened her in those times. -Ptolemy died two years later. -Antiochus restored Laodice and put away Bernice. -He was then poisoned by Laodice. -Bernice fled with her children to Daphne where she was killed. -He reigned 25 years, -four more than Seleucus. But he shall return into his own land. -When sedition arose in Egypt. -Seleucus died and Antichus (age 15) pressed the war. And they shall return and war, even to his fortress. and shall come forth and fight with him, even with the king of the north; and he shall set forth a great multitude, and the multitude shall be given into his hand. 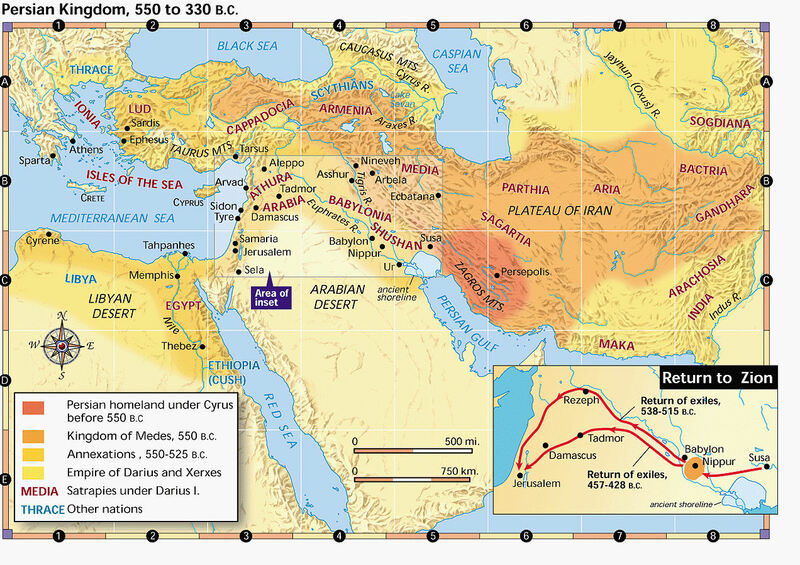 -Battle at Rapna victory over Antiochus in 217 B.C. 11:12. And the multitude shall be lifted up, and his heart shall be exalted; and he shall cast down tens of thousands, but he shall not prevail. -His people were dissatisfied at peace made with Antiochus. with great army and with much substance. also the children of the violent among thy people shall lift themselves up to establish the vision; but they shall fall. -The Jews would rebel against Egypt but not gain independence. -Scopas, a general of Ptolemy defeated at Paneas 198 A.D.
neither shall there be any strength to stand. and in his hand shall be destruction. but she shall not stand, neither be for him. -She did not stand with her father's designs. -Scipio Asiaticus (Roman), brother of Scipio Africanus who fought against Hanabal. yea moreover, he shall cause his reproach to turn upon him. -Complete overthrow of Antiochus the great in battle of Magnesia, B.C. 190. He was compelled even to give his son, Epiphanes, as hostage and to pay the Romans tribute. but he shall stumble and fall, and shall not be found. -A raiser of taxes who sought to appropriate the wealth of the temple to help pay the Roman tribute. neither in anger nor in battle. -The true heir of the throne was Demetrius. and shall obtain the kingdom by flatteries. yea also the prince of the covenant. -Probably the king of Egypt who's covenant with Antiochus the Great had been overthrown. -Antiochus repudiated pledges of Coelo-Syria and Palestine to Egypt to Ptolemy Lagus by treaty in 301 B.C. and Antiochus the Great, in dowry of Cleopatra as queen of Egypt. for he shall come up, and shall become strong, with a small people. -Antiochus gradually took over Egypt with a small force. -He withdrew from Egypt when the Romans threatened him and the Jews rebelled at the report of his death, vowing to punish them. for they shall devise devices against him. -Antiochus held the rightful heir, Ptolemy Philometor, and fostered discontent against Ptolemy Physcon. and many shall fall down slain. -Antiochus and Ptolemy Philometor, who he controlled. -Antiochus had conquered Memphis, plundered its wealth and left Ptolemy Philometor in control of lower Egypt. and he shall do his pleasure, and return to his own land. but it shall not be in the latter time as it was in the former. -Ptolemy Philometor, who Antiochus had left in Egypt, joined with his brother, Ptolemy Physcon, and they obtained help from abroad. -The Romans, who controlled the islands threatened to intervene. and have regard unto them that forsake the holy covenant. -He placed Jews in power who were backed him. -Apollonius, the commander, polluted the holy city. and they shall set up the abomination that maketh desolate. -Atheneaus dedicated the temple to Jupiter, set up a pagan altar and sacrificed to Jupiter. The Jewish offerings were prohibited. A pig was sacrificed on the altar. but the people that know their God shall be strong, and do exploits. -Judas Maccabeus (“The hammer”) and his family. 11:33. And they that are wise among the people shall instruct many; yet they shall fall by the sword and by flame, by captivity and by spoil, many days. but many shall join themselves unto them with flatteries. because it is yet for the time appointed. for that which is determined shall be done. with a gold, and silver, and with precious stones and pleasant things. -At the time of the end of these events. and shall overflow and pass through. Edom, and Moab, and the chief of the children of Ammon. and the land of Egypt shall not escape. and utterly to sweep away many. yet he shall come to his end, and none shall help him. -The destruction of Jerusalem and tribulation under the Romans (cf. Matt 24:15-22; Luke 21:20-24) perhaps including the whole time of trouble of the Jews down at least to the time of their re-establishment of their nation. -Christians heeded the warning of Jesus escaped the city to Pella. This may include the larger picture of the “remnant” (Rom. 9:27; Isa. 10:22 etc) –all who have found refuge in Christ (Rom. 9:7-8; Philip. 3:3). 12:2. And many of them that sleep in the dust of the earth shall awake, some to everlasting life, and some to shame and everlasting contempt. 12:3. And they that be wise shall shine as the brightness of the firmament; and they that turn many to righteousness as the stars for ever and ever.